A cordless drill is one of those key tools that every man needs in his kit. Whether you’re doing a few repairs around the house or working full time in construction, you’ve likely spent a bit of time with one of these in your hand. Several years ago, cordless drills were used only when necessary. Short battery life and poor performance meant that a wired model was always preferred. 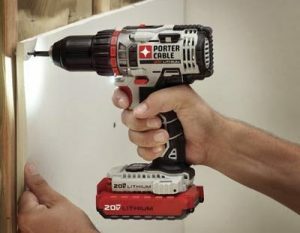 Thanks to advances in battery technology, cordless drill now performs just as well as their wired counterparts in almost every environment. The best drill will allow you to work efficiently, without any hassle. Unfortunately, not all drills are created equally. If you buy the cheapest one you can find, you’re in for some kind of trouble. Fortunately, there are better options. In this roundup, we’ll help you learn what to look for, and what to avoid. There are countless options on the market, and knowing which one is right for your needs can be a challenge. There is no one-size-fits-all option. What works for one person may not work for another. We’ve gone through and selected our favorite drills for virtually every application. First, we’ll go through each model one-by one to show you what it has to offer. 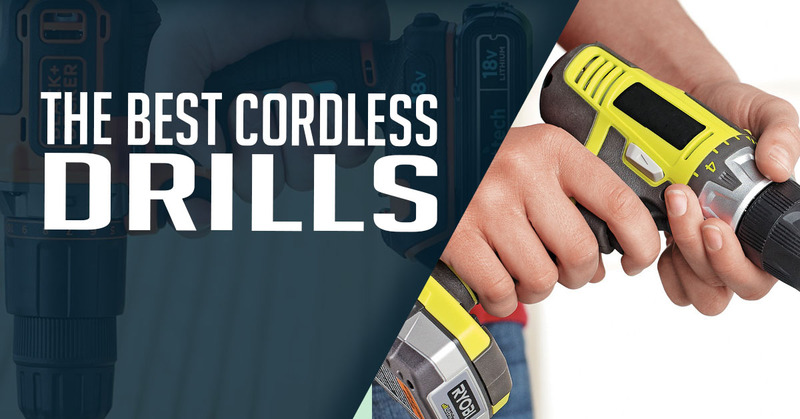 After, we’ll help you decide which of these top rated cordless drills is right for you. 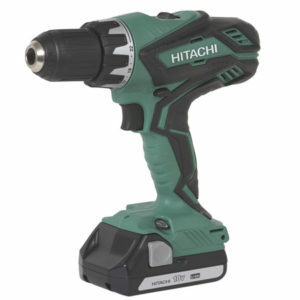 Although Hitachi isn’t one of the most well-known brands on the market, in-the-know consumers consider this to be a bit of a hidden gem. 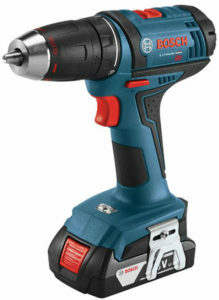 With 620 inch-LBS of torque and a speed of up to 1800 RPM, this drill packs a serious punch. The brushless motor is one of the most efficient on the market, ensuring that this high power doesn’t come at the expense of battery life. 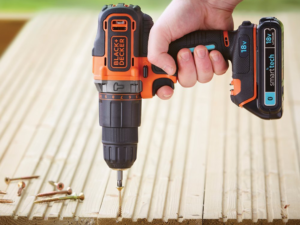 This combination of performance and versatility means that many consumers consider this to be the best power drill on the market. While there is a regular brushed motor version that is more affordable, the brushless version excels in almost every regard. You don’t need a tool to change out bits, letting you work on the fly. There are 22 different torque settings, so you can get the exact setting you need for the job. This results in less stripped screws, less broken bits, and less frustration. With all of these settings available, this is the best cordless drill for power users who don’t want to make any sacrifices. The two included lithium ion batteries are lightweight and won’t fade away as quickly as older models. They charge quickly so you won’t have to wait around for one to fill up, as long as you swap them out as you go. The trigger-activated LED work light is another great feature that just makes your life a whole lot easier. If you want the best electric drill that also has a ton of great features, this is a great option. Being so lightweight, it allows you to get into those hard to reach areas much easier. And if you’re ever working often above your head like for electricians, HVAC techs or when working with drywall, this design will let you put in longer hours without fatigue or strain. Despite being small and lightweight, it can still provide ample power. With a maximum torque of 350in/lbs and 1300RPM, this model is competitive with larger options. Of course, it’s not nearly the most powerful, but that may not be necessary for some jobs and that’s the tradeoff you should expect. Battery life is great, since the two included lithium-ion 18V batteries hold a significant amount of charge. This lightweight tool is an awesome buy for household use and also for professionals who want something smaller and compact that easily fits in smaller pouches and kits and can be used in tighter areas. Makita tools are always in the consideration for top choices in any class, and this is no exception. What sets this Makita apart from the other drills on our list is the difference in their batteries. It uses 18V batteries similar to the others, but it is a 3.0Ah battery as opposed to 1.5Ah. The Ah unit (amp-hour) is a measure of how long (in hours) a battery can provide a specified amount of current (standard is 1 amp). 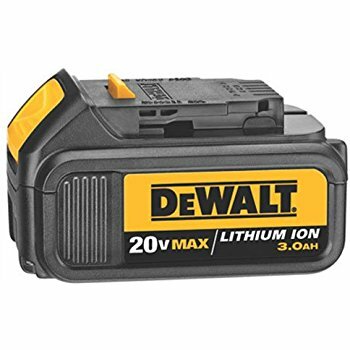 You won’t actually get 1.5 or 3.0 hours of use from either of these batteries because using the drill normally drains power at a faster rate than just one 1 amp. But, you CAN use the two numbers to compare between the two. In other words, a 3.0Ah battery should (all other things being equal) last twice as long as 1.5Ah battery, with the only drawback being they will be heavier due to the larger size. 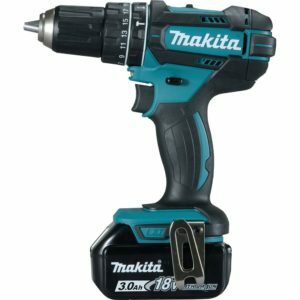 Besides its impressive battery life, the Makita still holds its own with a maximum torque of 600in/lbs and 1900RPM. The batteries charge quickly and the LED work light keeps your work illuminated. Overall this is an awesome choice for those that need the extra battery life and don’t want to spend time swapping batteries. Sometimes you don’t actually care about having the most powerful model or the longest lasting battery. While quality often decreases along with price, some folks may just need something to get the job done and aren’t as worried about how it may last over time or perform in more difficult scenarios. 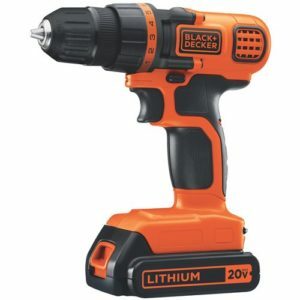 If that sounds like you, then this Black & Decker is potentially the choice for you. While it only produces 115in/lbs of torque and a maximum of 650RPMs, this is still enough power for most simple and basic household uses. Despite the smaller 1.0Ah battery, it still provides decent battery life since the drill itself draws less power. The plastic feels thin and cheap, but that’s just another area where you’re saving on price – as always, you get what you pay for. That being said, what it lacks in power and build quality, it makes up for with its lightweight and ergonomic design. While you shouldn’t expect anything close to a professional-grade tool, if you just need a simple and basic tool for light jobs around the house, this is a great affordable option. 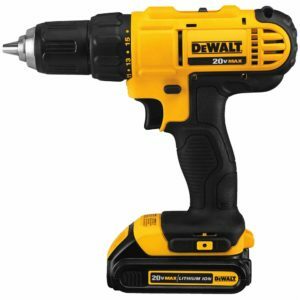 This Dewalt has a maximum torque of 300in/lbs and 1500RPM which is an ample amount of power for most jobs around the house and lighter work site needs. The 20V 1.3Ah batteries provide comparable battery life to the other 1.5Ah batteries on the list. There are two of the lithium-ion batteries included, so you can always have one charging and never stop working. And, at 3.6lbs it’s about the same weight as most of the others (not including the Bosch) though maybe slightly on the heavier side. And, like the others, it features a LED work light. Overall, for this combination of features and specifications at the price point, you won’t find much better. Now that you’ve seen a few of our favorites, what is it that sets these models apart from countless others available online? And how do you know which one is right for you? We spent countless hours rating every drill on this list by a variety of factors. But to find the one that’s right for you, you’ll have to consider your own individual needs to find out what you need. There are a few key factors you need to look at, and we’ll walk you through all of them one by one. In many cases, you can’t tell if a drill is “good” or “bad” just by the inclusion or omission of one of these features. But depending on your job, all of these factors could make or break your purchase. The inner jaw of the drill is referred to as the chuck. Most models have a 3/8 inch chuck. This is the most common drill bit size, and is also used by a variety of screwdrivers, hole saws, and other specialty bits. However, many of the higher power models have a half-inch chuck. This will allow you to drill larger holes, as well as give you access to a variety of heavy usage bits like concrete bits. The one downside with larger bits is that they require more torque to turn. Even though a half inch bit is just a fraction of an inch larger, in some cases the required torque doubles. For this reason, you’ll generally only find half-inch chucks on higher performance drills. In the event you do find a large chuck on a cheapo model, we’d advise you stay away as the motor may not be powerful enough to really use these bits. Old-school drills have what’s called a keyed chuck. These include a special wrench that looks a lot like a planetary gear. The benefit of this is that it allows you to get your chuck very tight around the bit, but it’s much more cumbersome to change out bits. On the flip side, the gross majority of cordless models now have keyless chucks. 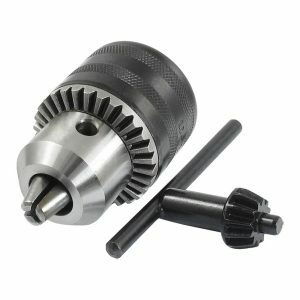 This takes the form of a large black gear that you turn by hand to tighten the chuck. The advantage of this is that you can change bits on the fly, and you don’t have any key to lose. However, watch out for inexpensive models with poor gearing, as you’ll occasionally run into a chuck that just doesn’t want to stay tight. Just as the clutch in a manual-drive car allows you to change gears, the clutch on a drill lets you change the speed. These days, almost every drill comes with a clutch. What varies between them is the number of speed settings. The more speeds you have, the more technical you can get with your projects. Less speeds are cheaper, simpler, and less likely to wear out over time, but you may run into issues with hard-to-drill material. 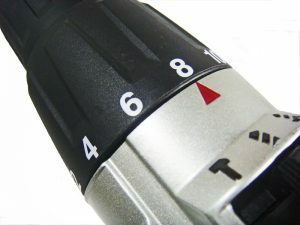 Many modern drills have LED lights mounted in the front. These lights illuminate your working area while the trigger is depressed, and generally remain on for 15 to 30 seconds after you let go. This is a simple feature, but can be a godsend when you’re trying to punch holes in a dark, hard-to-reach place. This one is easy to overlook, but can prove to be extremely important. Some of the most powerful, robust drills weigh quite a bit. 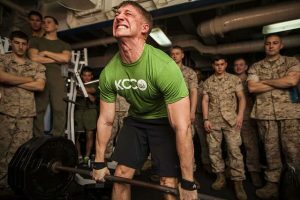 If you’re going to spend hours with one of these tools in your hand, just a few extra pounds can be extremely fatiguing. Consider how much time you’ll be spending with your drill, and get the most lightweight model that meets all of your needs. Voltage is one of the most heavily advertised specifications in the drill industry. Can we blame them? It’s an easy sell! At first glance, it seems obvious that 18 volts would be better than 12. And 20 volts must be better than 18, right? This isn’t always the case. In fact, voltage is one of the most misunderstood features of a drill. It’s often incorrectly assumed that voltage affects the battery life. But this isn’t entirely true. It’s very possible that an 18V battery will have a shorter life span than a 12 volt, but this isn’t always the case. Voltage is the difference in electrical charge from one terminal of the battery to the other. This means that more current can flow at a higher speed. The end result is that torque is directly correlated to voltage. a 12 volt drill is perfectly fine for punching holes in wood, while 18 volts is better suited towards denser material. if you’re going to be working with steel, 20V is almost always recommended. However, you shouldn’t always get the highest voltage you can find. 20V drills are extremely torque. In fact, you can easily sprain your arm if you snag the bit on a piece of steel or bind the drill up. These heavy-duty motors are for heavy duty jobs, and not something that everyone needs to have around the house. There are three dominant types of batteries on the market. At the bottom of our list is Nickel Cadmium, or Nicad. This is an older technology, and was used in almost every cordless drill on the market up until the last decade. Nicad batteries are very durable and can last a long time. However, they need to be treated properly or else they can be ruined. Nicads need to be kept on the charger and stored will a full charge. They also can develop a memory, so it’s best to fully discharge them before you put them back on the charger. Most of the time, this isn’t always an option. So for many consumers, the batteries slowly lose their capacity over time. Nicads are also toxic for the environment, and can’t be thrown in the trash. On the flip side, they are very inexpensive to make so you can save a little money. NiMH or Nickel-metal-hydride is the most common type of battery you’ll find. They are much more compact that Nicad, drastically reducing the weight of your drill. 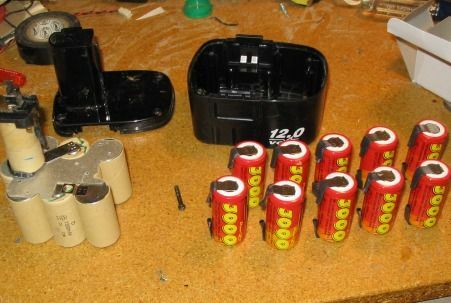 They have much higher capacity, and larger voltage battery packs are easier to design. They charge more quickly than Nicad, but the life span is not quite as long. Heavy users will get a year or two out of them, while light users might see three to four. Lithium batteries are the best on the market. They last an extremely long time, and even heavy users should get a minimum of five years. They have no memory. You can store them empty or full, and you can charge them whenever you like. They are the lightest type of battery on the market, and can easily be refurbished once they reach the end of their life. One of the downsides to lithium is the charge time. They don’t recharge evenly. The first 80% of their capacity is lightening quick, but the charge slows down as the battery approaches full. Heavy users might have to wait a little longer, or deal with not getting the maximum capacity their battery has to offer. Additionally, Lithium batteries are expensive, and only found in the highest end drills. Last but not least, consider the cost of the drill. If you’re anything like us, you take pride in your tool kit. Drills are a must-have for most trades, and many of the top end models are designed for people who use them day in and day out. It’s important to ask yourself what you really need a drill for. If you’re simply hanging up photos and doing a few odd jobs around the house, does it really make sense to spend hundreds of dollars? Your entry level drill might lack plenty of features, but it will still do a great job of most simple tasks. On the other hand, regular users will want to spend a bit more money. It can be frustrating to blow half a paycheck on a single tool, but when you’re spending several hours a day using it you’ll quickly appreciate the premium features. 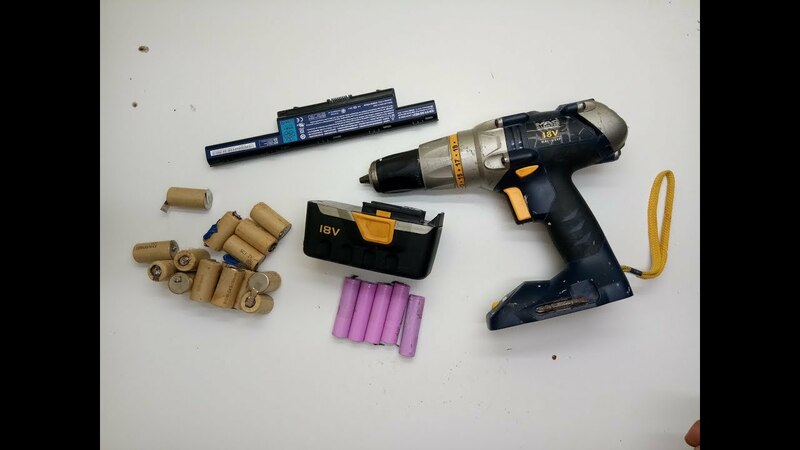 You’ll spend less time swapping out batteries, and you’ll be able to drill through tough material quickly and with ease. When warranted, it’s worthwhile to spend the money.